Alone time has been a scarcity for me recently. We had precious family in town for 10 days. On the same day they headed home, my husband’s job took him to London for five days. It is in these times, with three small ones relying on me 24/7, I remember how meditation is my saving grace. Before my support left town, I had a moment to really soak in some passages from my Bible. As I read, Isaiah 52:7 jumped off the page at me. I decided to scratch it down on a small piece of paper so I could memorize it. Whenever I find myself alone with the kids for consecutive days, I have learned to lower my expectations on Day 3. I’ve done this drill enough to know that Day 3 is often a rough one. Any sort of adrenaline or super woman powers I felt at the beginning disappear, and physical and emotional fatigue start to set in. Day 3 is when I feel the pain in the climb before reaching the peek of the mountain. But this time, as I panted my way through Day 3, Isaiah kept coming to my mind like a mantra. This particular Day 3 had a new lesson for me. And it hit me like a freight train. Isaiah doesn’t say, “How beautiful on the beach (grass, path, etc.) are the feet who bring good news”. He says mountains. It is in the challenging, straining moments where a kind word or pat on the shoulder are welcomed. And where truth has the most dynamic impact. Day 3 is when I need someone to say, “You’re doing a good job little Mama. Hang in there.” I need to be reminded that there’s relief in sight, that the downward slope is just steps away. Even if I feel like the worst version of myself as a mother on that day, I need to hear the truth that I’m not screwing up because I’m showing up for them and loving them fiercely nonetheless. This is the kind of reminder that breathes hope into me. It revives me with energy and peace at the same time. It alters what would be challenging, tiring interactions into positive, fresh ones. It causes doubt to fade away and makes me believe. Tatum and her family are one reason why I know Jesus is real and He loves me. 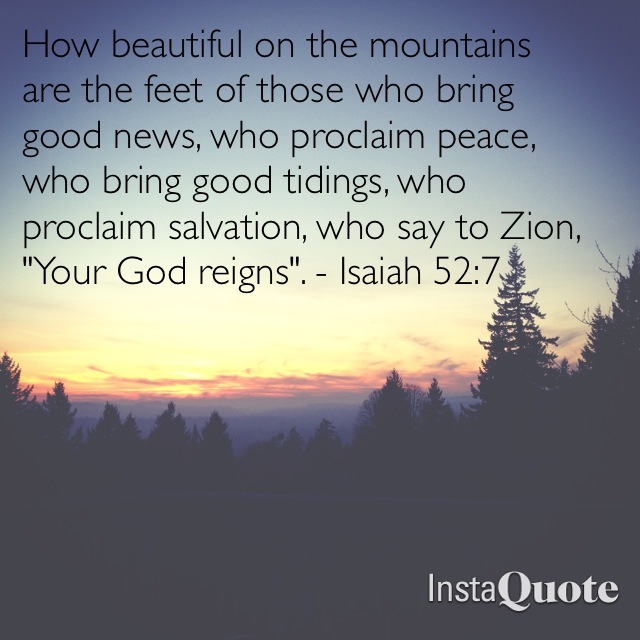 He saw me climbing my mountain this week, and He sent beautiful, precious feet to bring me breath… refreshment… truth… peace. And this made me wonder, “How can I be these feet to someone else?” We have several interactions every day with other human beings. And each of us are facing our own mountains. Whether it be parenting little ones, a battle with cancer, an unhealthy family relationship, a job that is sucking the life out of you, or having to make a difficult decision. We all have to climb from time to time. And we all need breath, a bit of refreshment, truth and peace in those difficult moments. How absolutely incredible would it be if we all were able to be a Tatum to somebody else? How can we be feet who bring good news to someone else? Next > Now Choose Life!